Do you trade with the crowd or against the crowd? The question is not as simple as it might look at first glance and actually depends not only on your personality as a trader but also on your approach to sentiment analysis. More than half of this blog’s readers use the Commitments of Traders report, which is the best known sentiment analysis gauge out there. This means that traders give at least some consideration to what others are doing. Even if you are trading without looking at what other traders are doing, there is no denial that many traders look for confirmation of their trades in sentiment indicators or try to bet against the crowd by looking at the same indicators. Nowadays, there are many ways to be aware of other traders’ positions — CoT-style reports, order ratios published by brokers, analysis of prevailing ideas on TradingView, forums and social networks, and so on. 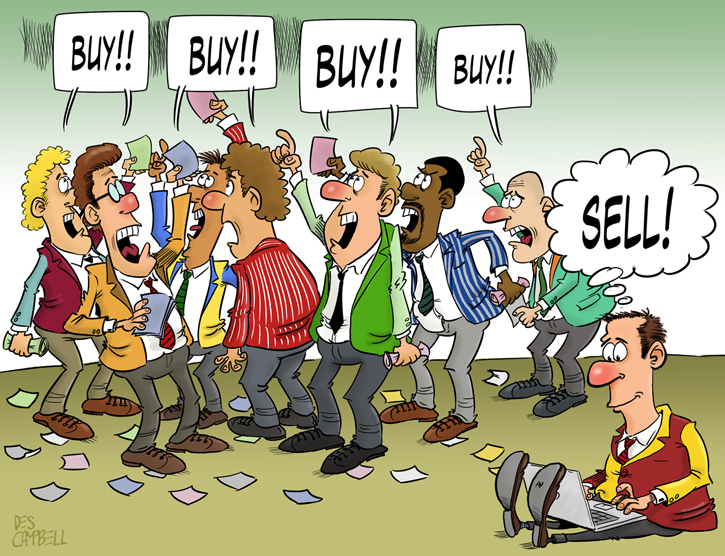 The main idea of being in the same direction as the majority of other market participants is to be buying when everyone else is buying and to be selling when everyone else is selling, which means that you will not find yourself on the wrong side of a major trend. From watching your trade being aligned with other traders’ positions, you might also get confirmation of the validity of your pre-trade analysis. Not only it is vital to any Forex beginner, who is not yet certain in own skills, but can be a good confidence booster for traders of any level of expertise. Setting up a position, which goes against the prevailing market sentiment, has its merits too. After all, about 75% of all retail traders are losers, so why would you want to be doing what they are doing? Straightforward trading against the crowd (against retail crowd, of course) is a long-time favorite strategy among professionals in all sorts of financial markets. It is like doing the opposite of what some clueless newbie trader would be doing. Of course, not everything is so simple as it sounds as sentiment information is changing rapidly, especially in regards to the order levels, which would determine a contrarian’s entry and exit points. Going with the majority looks much simpler than what a properly prepared contrarian would have to do. Although I am not a fan of a sentiment analysis (due to how difficult it is to apply in real life), I sometimes use sentiment indicators (mainly brokers’ order/position ratios) to assess whether some of my medium-term trades are worth opening or keeping. And when I do that, I prefer to be positioned against the dominant position by retail traders. So far, it works out quite well. And how about you? I prefer my trades to be positioned in the direction of the majority. I prefer my trades to be positioned against the direction of the majority. I do not check how other traders are positioned before entering my trade. If you want to say something about how you use information about other people’s trades in your own analysis, please do so using the commentary form below.